Steve... always available to assist you at Greenshedconversions. 1956 Ford F500 F500 , Warp11, Zilla 1K, Leaf Batteries. Steve Clunn has been building Electric Vehicles for more than 20 years. First as a hobby, and most recently, full time, in his new shop located in Crystal River, Florida. Steve first decided right after the Gulf War, not to be so dependent on Foreign Oil and set out to create his first EV. At that time there were very few parts and very little help. Steve's expectations for his first electric car was not high. 30 mph and a 10 mile range was all he was hoping for. 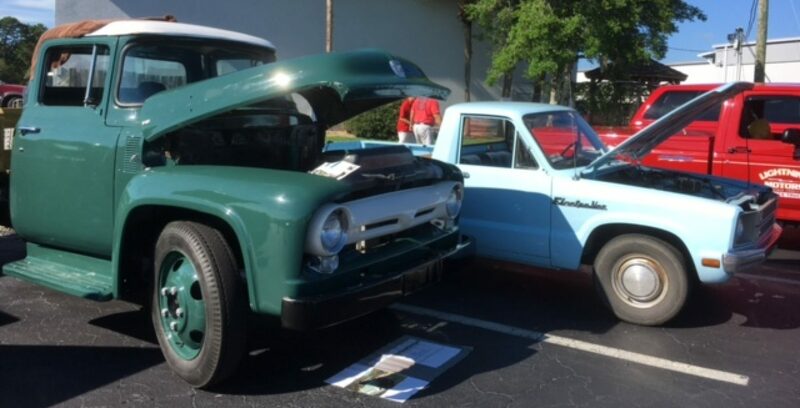 But much to his surprise, his first EV worked out much better and he started using it to pull his lawn trailer and it became his all time EV work truck, which he drove 76 miles at the Sunday Challenge. For the next 5 years Steve showed his car off to many people and converted two other cars, one to replace his first work truck with a Ford Ranger body. Jon Hallquist agreed to drive Steve's 5th conversion. Jon was so excited about his EV, that he and Steve started the company Grassrootsev.com to share their experiences and sell parts for other people to build their own EV's.In 2006 Steve decided to go "Full Time" and Opened GREEN SHED CONVERSIONS a full service shop in Fort Pierce, FL with Audrey Martin. ( now his wife). Together as a team they convert cars, trucks, motorcycles, and bikes. Anything with Wheels ! In the Summer of 2009 as the economy and our countries depression grew, Green Shed had no alternative except to "GO MOBILE" - "Have Meter will Travel" and our Summer Tours Started in the Summer of 2010. We went mobile to keep our doors open, traveling all over the US Converting cars at customers Shops and Homes. Set back by the theft of our Vehicle and all our tools and inventory in 2011, we came home, re outfitted and headed out again in 2012. Today Green Shed is now located at its new home in CRYSTAL RIVER, FL. Nothing will Stop us!! Ev's are here to stay! Just Look at TESLA ! My experience with Steve began in the summer of 2006 when I went to him for advice on converting a Chevy S-10 pickup truck. Steve made a list of components I would need, and talked about the conversion process with me. After I bought a truck, we went over the parts list and ordered the major parts. Steve is a generous guy and was always there when I needed help. I know that I would never have done the conversion without his help. Converting a vehicle was fun, challenging, and a lot of work! Thank you Steve for your help. I recommend Steve's conversion business to anyone in the US. The pickup became the subject of an eBook which I wrote with the encouragement and helpful advice from Steve. Gerald Wagner, Deceased, RIP. ( one of the movements Pioneers and sadly missed). Thanks for all of your help and being true, honest, normal people who have been in it for the right reasons. You folks are THE people I mention in that sense every single time I talk to people about the field. We ALSO did a RIDING LAWN MOWER for these wonderful GREEN PEOPLE... TWICE ! First they sent us FRANKIE... then we took all the parts off of FRANKIE and STEVE put them all on BLUE EYES, their newer Lawn Mower. Jose Barriga mentioned you in a comment. Jose wrote: "Thank you Steve Clunn and Audrey Martin from green shed conversions for their help and support. If you want an electric car, but do not know how to make it, Steve Clunn from Fort Pierce is the man. He has been converting cars to electric for years and they even have several electric cars for sale including a Lamborghini Diablo Kit Car for sale." About Us -Green Shed Conversions . . . ALWAYS here to assist you !